After all the Turkey Day indulging today and shopping extravaganza this month, you’re gonna need a little something-something to get you through to Christmas. Enter: The Coffee Cocktail. Part espresso laden buzz, part rich stout, part sweet treat, this is just the thing we crave on a bustling holiday afternoon. Or anytime really, morning, noon, night… you name it. We added a little simple syrup and whipped cream to sweeten this up a bit, just like jolly ol’ Saint Nick would like. 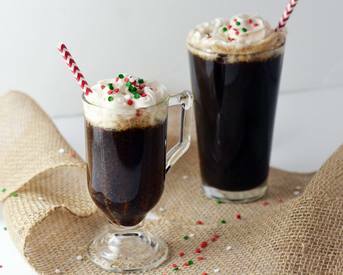 This drink will put some jingle bells in your step!